Prime Minister Narendra Modi cannot be held responsible for the booing and heckling of non-BJP chief ministers in some states, including Maharashtra, Shiv Sena chief Uddhav Thackeray has said. 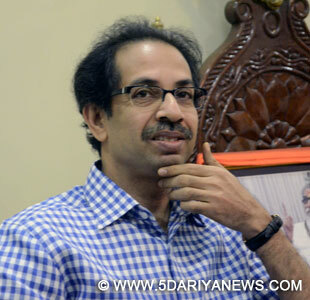 "The people who are booing are not imported from Gujarat or New Delhi, they belonged to Maharashtra, ditto in Haryana," Thackeray said, referring to the hooting of chief ministers of Maharashtra, Haryana and Jharkhand in official functions attended by Modi in the past few days.In an editorial in the party mouthpiece 'Saamana', he said Modi won the Lok Sabha election with a convincing mandate and wherever he goes, people raise slogans praising him. "How can you hold Modi responsible for this?" Thackeray asked. Thackeray termed "unfortunate" the decision of Maharashtra Chief Minister Prithviraj Chavan to boycott the prime minister's functions in Nagpur two days ago, but said such sloganeering reveals the mood of the people who are not in favour of the Congress.Implying that the Bharatiya Janata Party activists were repaying the Congress, Thackeray recalled the days of the previous Congress-led central government when Modi was the Gujarat chief minister. "Under the UPA regime, Modi was virtually a persona non grata, and no occasion was spared to insult him, though he was a duly elected chief minister of a state," Thackeray said. He said that during chief ministers' conferences in New Delhi, Modi was treated like a "step-brother", and the Congress-led government stooped to such tactics which could never be forgiven.The issue of heckling non-BJP chief ministers came to a boiling point when, in an unprecedented move, Chavan and other ministers of the ruling Congress-Nationalist Congress Party alliance boycotted Modi's functions in Nagpur.Other non-BJP chief ministers have also threatened to skip official functions in which the prime minister would be present to avoid heckling by BJP activists.